Masked Lapwing is native to Australia. Both sexes are similar, but usually male has larger spur. Adult has olive-brown upperparts and wings. Flight feathers are blackish. Rump is white. Tail is tipped black. Underparts are white. Undertail feathers are white, tipped with black. Crown is black. Both sexes have yellow wattles on face, and yellow bare skin covering forehead and upper area of eyes. Nape is separated from mantle by white collar. Bill is yellow with pale greyish tip. Eyes are yellow with yellow eye-ring. Legs and feet are dark pinkish. We can see a thorny wing spur, projected from the wrist. Spur is yellow with black tip. 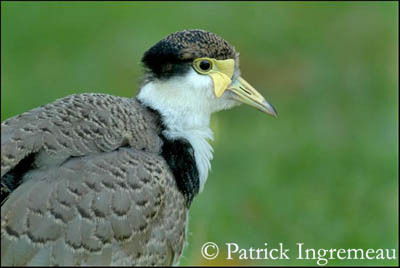 Masked Lapwings have large range and global population. Numbers are secure and classified as “Least Concern”. Young are similar to adults, usually with darker back. Facial wattles and wing spur are smaller or absent. Southern subspecies – Vanellus miles novaehollandiae – has hind neck and breast sides black. Facial wattles are smaller. Northern subspecies – Vanellus miles miles– is smaller, without partial black collar. Facial wattles are much larger and cover most of the face sides. Both sexes are similar in subspecies, and male has larger wing spur than female. Masked Lapwing can be noisy day or night. It utters strident, rapid “kekekekek”, or loud “keek-kick-ki-ki-ki”. It has several distinctive calls, such as single “kek”. 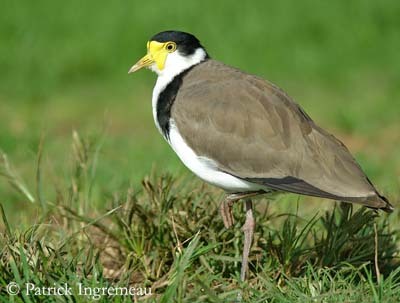 Masked Lapwing is often found in open grassy areas close to water, in wetland edges and moist open areas. It adapts very well and may be found in arid areas, beaches and urban areas. 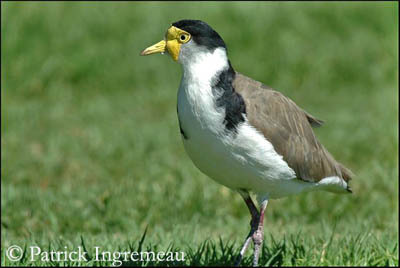 Masked Lapwing lives in Australia, particularly in northern and eastern parts of the continent. Vanellus miles miles lives in northern parts and Vanellus miles novaehollandiae lives in southern and eastern states. The last one was self introduced in extreme South of New Zealand in the 1930s, but now, it is spread throughout the country, and named Spur-winged Plover. 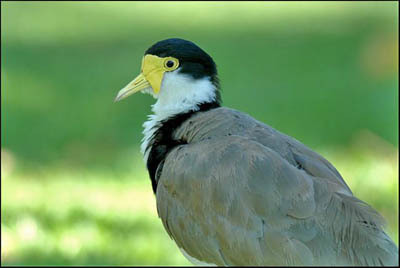 Masked Lapwing may also be found in Indonesia, New Guinea and New Caledonia. Masked Lapwing searches for food mainly on the ground, foraging by raking with one foot to extract invertebrates just below or above the surface. These birds often feed alone, in pairs or in small groups and loose flocks. Masked Lapwings defend strongly the nest-site and the eggs and nestlings. Adults dive bomb (or swoop) on intruders, and can also perform the “broken wing behaviour”, in order to lure predators away from the nest. Contact is rarely made. Usually, this behaviour ceases after hatching and when chicks are mobile. Parents defend large territory around chicks, rather than the nest-site. It may tolerate close proximity when living in urban areas, and used to human presence. However, it is wary of people and does not accept too close approach. 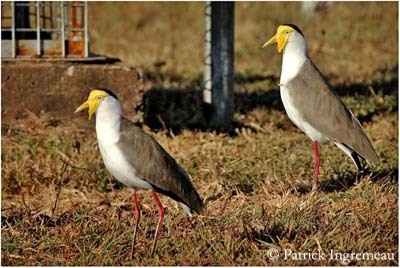 Masked Lapwings pair for life, and prepare territories in May-July. They tend to remain within the same area, and they rarely move far from the established territory. Masked Lapwing is sedentary and may wander locally, mainly at night, but only from roost to feeding area. Masked Lapwing flies with steady wing beats of its broad wings. Breeding season occurs at any time in the year, or after local rains. 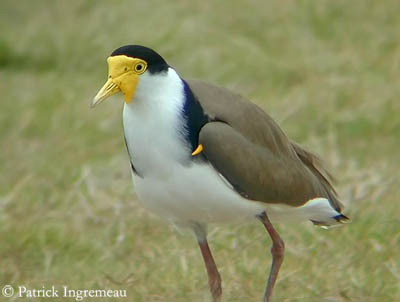 Masked lapwing breeds when weather conditions are suitable. This species may nest in strange locations such as roofs of buildings, school playing fields, airports, golf courses, urban parks and gardens. Nest is only a scrape in the ground, or a mound, built by both adults. Interior may be lined with grass and debris. Female lays 3 to 4 eggs at intervals of one day. Eggs are pale brown with dark spots. Incubation lasts about 28 to 30 days, by both parents. Chicks are precocial and leave the nest very soon after hatching, and sometimes, young leave the nest before all eggs have hatched. Both parents care for them for feeding, guarding and rearing them. Young are able to find themselves their own food, but they follow parents when feeding. They usually fledge about 6 to 7 weeks after hatching. Young become independent at about 8 to 10 months of age. They may form family groups after the young can fly. They reach their sexual maturity in their first year. This species produces one brood per year. 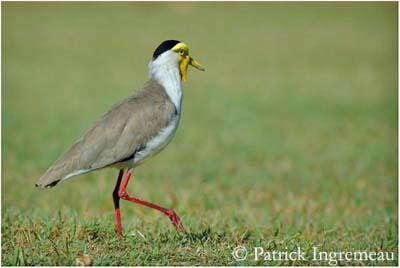 Masked Lapwing feeds mainly on insects and larvae, earthworms, crustaceans and other invertebrates. It also consumes leaves, seeds and occasionally frogs.